The first reading of the third volume of the one and only New Hampshire Pulp Fiction Series is scheduled for this coming Saturday (Nov. 23), 7 p.m. at Gibson’s Bookstore, 45 S. Main St. in Concord. This note is going out to anyone who is on my list and has been involved with the series, so even if you can’t make it or don’t know what I’m talking about, I want you to feel invited. Jim Kelly sent his regrets. He’s in NYC. Joyce Wagner is also out of reach and Suzanne Sykora, who wrote a fabulous piece for Live Free or Sci-Fi has the best excuse of all as she lives in Germany. The six readers (did I miss anyone?) are probably plenty to fill our time and if the crowd is chanting for more I can read them some of my introduction which, like Vogon poetry, will make their ears bleed and have them lunging through the plate glass to escape. That’s what you call a finale. By the way, there will be some kind of a write up on the latest book (and on the series) in the Concord Monitor on Thursday, so keep an eye out. Be sure to put it back, though. They squish if they roll on the floor and get stepped upon. Media coverage might bring us a few more earballs to delight, but the best way to ensure an audience for these readings is to bring one, so don’t forget to compel your significant other or your insignificant brother or some hapless bystander to join you. See some of you there. Maybe the next reading will be in Hanover, Germany and we can all crash at Suzanne’s place afterwards. The Press Release is Here! I know, it’s not really that exciting, but the pulp fiction genre dictates putting an exclamation point at the end every title. On the other hand, it is handy to have an official statement to spread around. Feel free to cut and paste this and send it to your local paper or radio station or Patch. And remember to help promote the reading at Gibson’s on Nov. 23. at 7 p.m.
It’s Time to Live Free or Sci-Fi! With a third volume now available and two more in the works, the New Hampshire Pulp Fiction Series turning into a local publishing phenomenon. Readings for “Live Free or Sci-Fi” scheduled for Gibson’s Bookstore in Concord, Nov. 23. 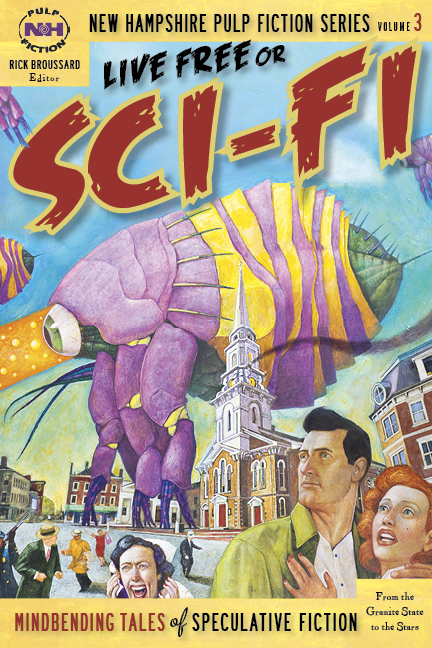 The third volume, “Live Free or Sci-Fi,” available now in independent bookstores across the state and online from nhbooksellers.com, includes 23 tales of “mind bending speculative fiction taking readers from the Granite State to the stars” — so reads the colorful book jacket, which also features a psychedelic nightmare image of Market Square in Portsmouth apparently under cosmic attack by giant space fleas. Two more volumes of NH Pulp Fiction are due out in 2014. “Love Free or Die,” an anthology of romance stories is scheduled for a February release, and “Live Free or Ride,” an anthology of all the pulp genres using the Concord Stage Coach as a common character, is planned for fall 2014. Readings from the current volume are already on track for the coming months. The first chance to hear the authors of these flights of fancy through time, space, and New Hampshire read aloud from their own works is at Gibson’s Bookstore at 45 S. Main St. in Concord on Saturday, Nov. 23, 7 p.m.
Below is a list of authors and stories in the current book, which includes such notables as Brendan DuBois and Hugo Award-winning writer James Patrick Kelly. Crack That Whip! Give the Past a Slip! Many have pondered the meaning of the opening lyrics to Devo’s “Whip It,” but I think it simply alludes to the well-known fact that the conservation of the vector of momentum that takes place in the final moments of the cracking of a leather whip results not only in a tiny sonic boom, but also a brief but powerful chronosynclastic infundibulum that launches the whipper precisely one nanosecond into the future. Any series of pulp fiction genres has to at least give a nod to a Western theme. We struggled a bit with how to set NH Pulp Fiction in the Wild West and finally realized the vehicle for such a mash up was hidden in plain sight. The Concord Coach, made in Concord, NH, is as iconic as Gabby Hayes (though he preferred to hang around the chuck wagon) and it offers a moveable feast of opportunities for storytelling in any genre you can imagine. I’m posting the guidelines to this new endeavor, but feel free to spread the word to any writer groups or newsletters you associate with. That’s right. 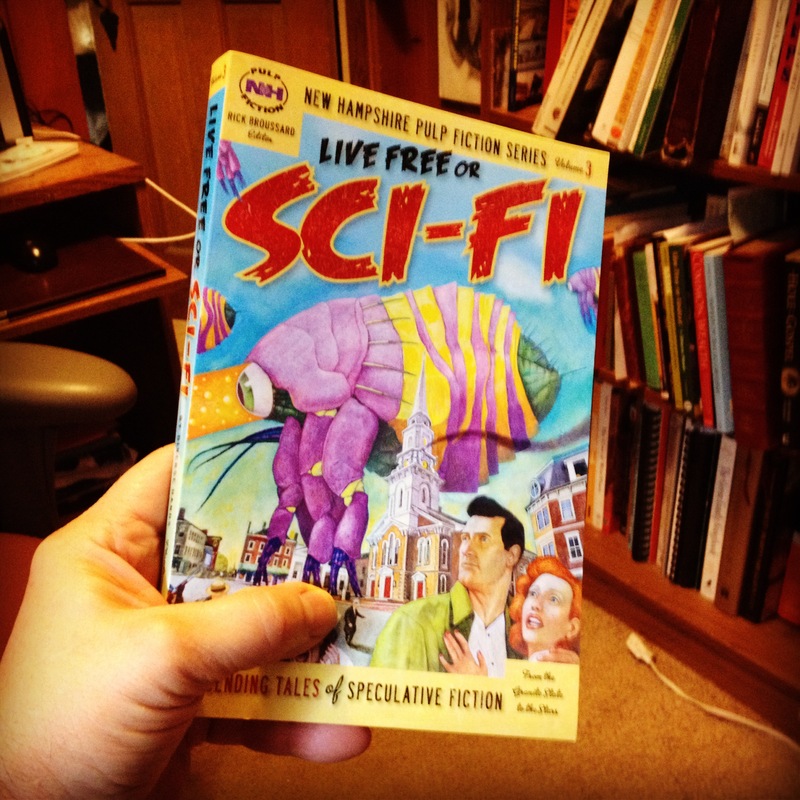 This one copy of Live Free or Sci-Fi has not yet been teleported or tractor beamed aboard the Mothership. From what I understand, there is a plucky band of other survivors huddled together on the shelves of Gibson’s Bookstore in Concord and others are seeking refuge in the secure confines of independent book dealers across the state. I also have reports that hundreds of them have found refuge in a warehouse operated by Plaidswede Publishers and accessible through nhbooksellers.com. But don’t let word get out or they might all be spirited away. I’ve finally (I hope) sent out letters to all the writers with stories that did not make the final cut. Below you will find the list of authors and story titles that I plan to include in Live Free or Sci-Fi (in no particular order). If your name is not on this list and you haven’t heard from me otherwise, please drop me a line and I’ll apologize for letting you fall through the cracks. I know how painful that can be. If you are on this list, sit tight and I’ll be composing a “So now what?” letter to update you on production schedules, request any rewrites or ask any questions I might have about your fine works of speculative fiction. This has been far and away my favorite batch of stories to read, probably because I’ve been a science fiction fan ever since I learned how to read. I’m looking forward to working with all of you in the coming months. My email is nhpulpfiction@gmail.com for any love notes, hate mail or less emotional inquiries about anything under the sun. Or over the sun. Or even inside the sun. Gotta love that sun.